Our Mists of Spring Square Wreath entices the senses out of winter’s uniformity and offers an ethereal hint of spring’s imminent floral symphony. 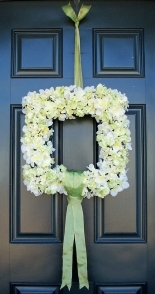 This contemporary square shaped wreath is as elegant as it is simple. It boasts sleek established style lines making it the newest, ‘must-have’ wreath design essential for the most stylish of décors. The simple repetitive floral composition of our Mists of Spring Square Wreath evokes a graceful warmth and genteel quality and it instantly transforms into the most beguiling ambassador for any door. We’ve delicately punctuated the shape of this square wreath design with an overriding floral composition of enchanting lime and cream silk flowers. Each petite flower perfectly overlapping one another to gracefully cover every inch of the wreath surface face. The sides and back of this wreath offers another striking overlap pattern display created with verdant silk flower leaves to further refine this stunning floral square wreath. To complete this captivating square wreath, we have added a silk wired ribbon in vivid green and encircled it snuggly at the bottom to form an elegant knot with free flowing ties. An elegant hanging loop of the same vibrant green ribbon is attached at the top to ensure that your new Mists of Spring wreath will hang at the perfect length in order to guarantee a breathtaking impression every time it’s seen! Treat yourself to this beguiling Mists of Spring square wreath or take advantage of our pair pricing and purchase a powerful wreath duo to display side-by side for an elegant spring design statement. Also be sure to shop our entire collection of spring designs for that perfect spring addition to your home interior!